Doñana Drinks, originally uploaded by jhoolko. So Spain won the World Cup today. First time ever. The video footage from Madrid was insane. I managed to watch games from this world cup in Gjirokastra and Berat, Albania; Como, Italy; Madrid, Spain; and Chicago, San Diego, Los Angeles, San Francisco, and Sacramento, USA. That’s cool and all, but why the heck did I leave Spain three weeks ago?! How did I miss the first Spanish victory and possibly the most important Spanish football game in history by three weeks? All I can say is that today, I drank a tiny sized beer in Spain’s honor. 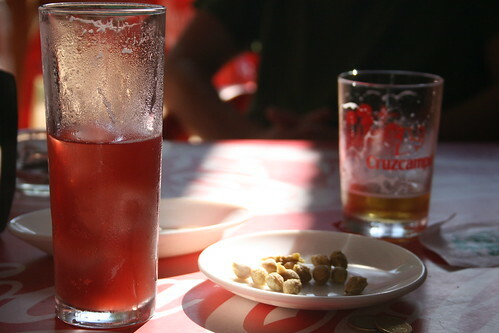 But that win would have been a heck of a lot better from a Cerveceria in Malasaña with a bit of jamón, a tiny plate of aceitunas and a nice cold tinto de verano. And a caña. Or two.